How much does it cost to travel to Cork? How much money will you need in Cork? €81 ($91) is the average daily price for traveling in Cork. The average price of food for one day is €24 ($27). The average price of a hotel for a couple is €96 ($108). Additional pricing is in the table below. These average travel prices have been collected from other travelers to help you plan your own travel budget. 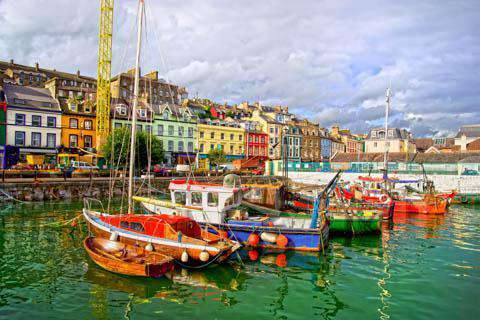 Located on the banks of the River Lee, Cork has a small, but pleasant downtown that is easy to walk around. The city was built up on marshland, and many of the streets today, including St Patrick's Street, the South Mall and the Grand Parade, are actually built over what was once river channels. Today there are more than thirty bridges that cross over the channelized River Lee. As an orientation, it's nice to take a historic walking tour of the downtown area. Then you can explore the area in more detail by yourself. There are cathedrals, museums, and galleries around town so you can keep yourself quite entertained. If the weather is nice, head out to Lough park, which has a small freshwater limestone lake and some interesting water fowl to see. It's a great place to people watch and see daily life in the city of Cork. Cork's climate is mild with lots of rain. The temperature rarely drops below freezing and extremely hot days above 25 degrees Celsius during the summer months are also uncommon. It rarely snows and if it does, the snow does not linger long. There are an average of 152 rainy days a year and foggy weather is common. Still, you can expect on average about 4 hours of sunshine most days. One of the must see attractions in Cork is Elizabeth Fort, which offers a great view of the city. Near the fort you will find St Finbarr's Cathedral, witch is a gothic building constructed during the 19th century. In town you will want to swing by the Lewis Gluckman Gallery if you're interested in art. A visit to the University College Cork while you're in the area is worthwhile as well. Most visitors spend almost all of there time in the city center of Cork. There you will find plenty of restaurants, hotels and most of the city's main attractions. It's a compact and small area that can easily be walked around. It is recommended that you grab a map before you begin exploring. During the summer and fall months there are some great local festivals that are worth checking out. The Midsummer Festival lasts for a month between June and July and includes art, poetry, and drama. The Film Festival, which is more than 50 years old, is in November and has both Irish and international films. The Jazz Festival is one of the largest in Europe and is at the end of October. Finally, the Elizabeth Fort Market Festival showcases Cork heritage and takes place every Sunday. It's a great place to check out some local crafts, taste some good food, and have a cultural experience. There are plenty of different dining options available in Cork. One interesting place to eat is the Cork English Market. It's located near Grand Parade and South Mall and is open between 9:00 am and 5:30 pm. This is an old, covered market that has a variety of great food available in a nice setting. There is often live piano music as well. The Ivory Tower is another notable place to eat in Cork. It offers an eclectic setting with unusual food. It can be quite pricey, but you can experience an eight course traditional Irish Food Tasting menu if you choose. The restaurant is small and the staff is very friendly. International options around town include Thai food, pizzerias, Italian, Chinese and Japanese. These restaurants are often more affordable, but the quality of the food can be variable. Cork has a small city center, so you can really explore most of the area on foot. In general, you do not need to use public transportation as a tourist. If you do decide to travel further outside of town, then there are bus routes that go to the residential suburbs. Most of the buses leave from St. Patrick's Street, South Mall, Grand Parade and Merchant's Quay. You can also catch a guided bus tour at the intersection of Grand Parade and South Mall. This is a good way to get oriented and see the main attractions of the city. Taxis are readily available around town and prices are set for in town trips. If you're heading further out of town then you may want to negotiate the price. You can also discuss a guided tour with taxi drivers as these are often available. There is also a carpooling program available in Cork. This is predominantly used by commuters that travel between Kinsale and Cork during the mornings and evenings. While this is one of the more touristy and popular castles around Ireland, there is a good reason. It's truly worth the crowds and lines, but it's still advisable to get here around 9 am when it opens. There's a good chance you'll miss the crowds. The stairs to the top can be a little uneven, but nothing you should really be concerned about. And definitely don't pass up the opportunity to kiss the Blarney stone, even if you do have a fear of heights. Friday nights are a great time to see some of Cork's fun pub culture. You can join the Cork City Pub Crawl which is organized every Friday by young residents to bring tourists and locals together for a pub crawl (kind of a tour really). It starts every Friday at 8 pm just outside of the GPO on Oliver Plunkett St. You hit four different pubs and one of the best clubs in Cork. You do have to pay ten euros to join the crawl, but it includes one shot of jaegermeister, one shot of whiskey, and two shots of apple sourz, plus entry into the club, so it's really a good value. At the club you'll find both travelers and locals, so it's a great way to get out and about in the town. It's a great way to experience Cork nightlife and meet some fellow travelers as well as locals.